A delivery driver at Eagle Couriers found himself with a rather unusual front seat passenger, when he was tasked to deliver a pair of delicate amphibians to their new owner. Dave Durnan, the Eagle Couriers driver from Musselburgh, sat next to two False Tomato Frogs for the 45 mile journey from Edinburgh to Glasgow, delivering them to their new owner. Luckily for Dave the pair didn’t give out as much as a croak of complaint during the entire journey. He said: “The frogs were definitely the strangest thing I’ve had to deliver. I’ve taken tractor wheels over mountains and picked up luggage in the middle of the night but nothing compares with the frogs. “I only found out what I would be delivering when I phoned in morning, and when I picked them up they were carefully wrapped in special boxes in a shopping bag. I didn’t actually get to see them, and thankfully they didn’t make any noise. “I placed them in the front seat of the van with the seat belt round the box to ensure they were securely in place and wouldn’t move when in transit. The job was ordered by Michelle Hamilton who rescues and rehabilitates amphibians and reptiles. This was the first time she has used a non-animal courier and she was thoroughly delighted with the service and the care given to the delicate cargo. She said: “Eagle Couriers were very helpful and took extra care to make sure the frogs were well cared for and protected during the long journey. “Trips like this can be very distressing for animals as small and as sensitive as this and the reality is that sometimes they don’t make it, even when we use specialist animal couriers to do so. But the fact that these little guys have arrived safe and sound is testament to the service of the drivers there. The duo which have been named Spock and Sylar have come to Michelle where they will now enjoy their new home among other amphibians and reptiles including Mama Jama, the Australian white tree frog, and Karma, the gray tree frog. 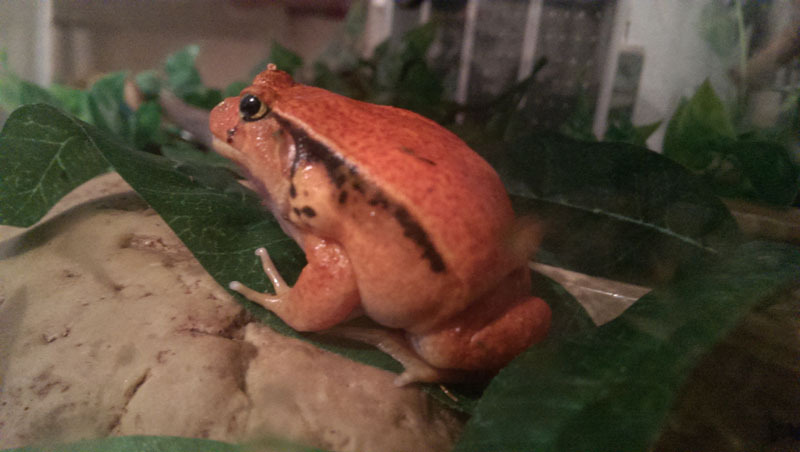 James Wilson, the False Tomato Frogs’ first owner was moving and could no longer care for the pair in his new home. Before they set off on their journey the frogs were covered in sphagnum moss to provide padding, warmth and oxygen, before being packed into a special plastic box fitted with air holes. Eagle Couriers is well versed in delivering animals. In September 2009, Eagle Couriers reunited Sampson the cat with his family after he was found in Plymouth, on the south coast of England, 478 miles away from his home. Eagle Couriers collected Sampson and safely delivered him back to Penicuik, reuniting him with his family for free. Established in 1985 Eagle Couriers has almost 30 years experience in the safe and quick logistics services to organisations across the private, public and third sectors, as well as working directly with consumers.